> Have original stickers which read: Side one: "RCR Royal Crystal Rock Cristallo Al Plombo 24% Italia," with the RCR crown logo. 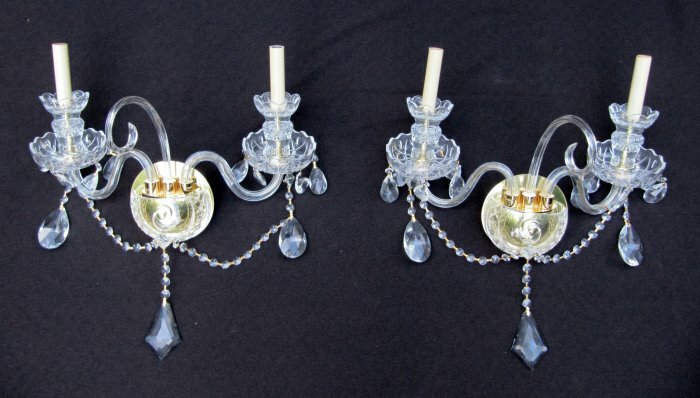 Side two: "Lead Crystal, Cristal Au Plomb, Crystal du Chombo, 24% Cristal Al Plombo, Loodkristal, Bleikristal, Made in Italy"
> Each fixture has two curved arms and a central curved crystal accent piece. CONDITION: In excellent hardly used condition, no breaks chips or missing pieces. A bit dusty in places, but complete and casting beautiful light and reflection. Does not include light bulbs.